Many of their shows have a signer (for British Sign Language) and have audio-descriptions. The seating is on 3 floors. There is a bar where you can meet friends for food and drinks. They serve Caribbean and English food. There is FREE entertainment in the bar every evening between 6.00 pm - 8.00 pm, like live music. Every other Sunday, from 5.00 pm, there is performance poetry. On Mondays they have comedy stand-up - it's best to come early for this. There is a payphone inside if you need to use it. BUT, if there is a show on the theatre closes at 11.00 pm. You can book tickets by phone on 0208 534 0310. Click here to book tickets online (it is possible to get concessions this way). There is no charge to book tickets online. People with disabilities, senior citizens, unemployed people and students can have a concession price. The standard concession price is about £4.00. Phone 0208 534 0310 for more information. A burger and fries costs around £5.25. 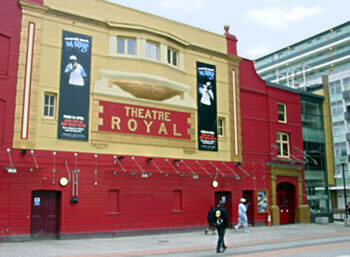 The Theatre Royal Stratford East is a landmark, it is near the Stratford Broadway bus station. 1. Salway Road 'pay and display' car-park. This is behind the Theatre Royal. There are 4 accessible parking spaces. 2. Stratford Shopping Centre multi-storey car-park. This is a 'pay and display' car-park on Great Eastern Road. There is a drop-off point for cars and coaches at the taxi rank. 308, 69, 257, 86, 104, 108, 238, 241, 257, 262, 473, D8, S2 are the nearest accessible buses. N69 and N25 are the nearest fully accessible night buses. (Jubilee Line and Central Line) - Stratford underground station is about 200 meters from the Theatre Royal. Stratford underground station is accessible for wheelchair users. Stratford DLR station is about 200 meters from the Theatre Royal. Stratford DLR station is accessible for a person using a wheelchair. Stratford mainline station - is about 200 meters from the Theatre Royal. Stratford mainline station is accessible for wheelchair users using lifts and ramps. The doorway into the theatre and ticket office is flat with automatic doors. The Ground floor is flat, the reception counter is a good height for wheelchair users. There is a sound loop and a Minicom, the staff are trained to use them. There is a ramp to get to the bar. Staff show you to your seats. If you use a wheelchair it is best to have a seat on the ground floor. The doorway is 800mm wide. The lift is well-lit and also has Braille buttons. There is an accessible and unisex toilet on the Ground floor and Floor 2. To find out about the shows which have a signer or audio-descriptions call for more information - 0208 534 0310.